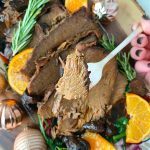 If you're looking for an impressive holiday beef roast with minimal effort, you've found it with this Slow Cooker Rump Roast with Prosciutto and Figs. Trim most of the visible fat from the rump roast. Place the roast in a 6 or 8 quart slow cooker. Top the roast evenly with the prosciutto slices. In a microwave safe bowl, combine the butter, balsamic vinegar, orange juice, sugar, rosemary, salt and red onion. Microwave for about one minute, or until butter is melted. Stir well to combine and pour over the prosciutto-topped beef roast. Scatter the figs on top of the roast. If serving right away, remove the roast and slice or shred the meat. Add the meat back into the slow cooker with the liquid and figs. Keep the slow cooker on warm to serve. If storing, remove the roast and place it on a plate. Cover it with plastic wrap. Place the figs in a separate bowl and cover. Place the broth in a separate bowl and cover. When ready to serve, skim off the fat layer from the broth (there won't be much). Slice the roast. Place it in a slow cooker or in a roasting pan with the figs and broth. Slowly reheat and serve.